I’m out of practice with my guitar. I’m not a particularly good player, but it’s fun to noodle around and make what music I can. But it’s been weeks since I’ve picked it up, and I know it will take time to get back into practice. When I play after a long break, my fingers seem slower on the fretboard. The chords don’t come easy. Pressing down the strings hurts my fingers until I’ve played enough to build up callouses on my fingertips. But if I keep playing regularly, it gets easier. My hands are quicker, and their movement is more fluid. I don’t have to think about chord changes. My hands just know where to go. The discipline of practice results in the freedom to make music. And so it is with prayer. I grew up thinking of prayer as a sort of stream-of-consciousness conversation with God. It was sometimes a struggle to come up with the right words to say. I’ll admit to being jealous of those I heard praying in church so fluidly, their soaring language surely reaching the heavens. It was like the freeform playing of an accomplished jazz musician. When I began to investigate Orthodoxy, one of the first things I did was look up the prayers of the Orthodox Church. I began trying some of them out for size, ending my day with the prescribed evening prayers. It felt odd to recite pre-written prayers. I worried about “vain repetition.” How could reciting someone else’s words be honored by God? I’ve slowly begun to understand that the prayers of the Church are part of her theology. We learn how to pray by learning what to pray. And when we begin to understand how to pray, the act of prayer comes more easily. As with playing an instrument, or physical exercise, freedom comes through discipline. The rigor of practice allows us to perform with more fluidity and less effort. What begins as a struggle becomes more instinctive. It’s when we fall out of practice that we stumble. When my guitar begins to collect dust and my fingers heal, I begin to lose the freedom to play without effort. When we fail to pray regularly, our connection to God becomes distant and we fall into our same old habits. I start my day with the Jesus Prayer. It’s like a warm up before exercising. I won’t claim that I do so every day without fail, but I pray it often enough that it’s almost a reflex. The practice of prayer gives us the ability to “pray unceasingly,” because we are conditioned by discipline. If you’re struggling with prayer, try treating it like a workout. Start small, with the Jesus Prayer first thing in the morning. In case you need a reminder, here’s a mobile wallpaper. It might help if, like me, the first thing you do when you wake up is check your phone. Once you have developed that habit, add a morning or evening prayer (or both). If you forget, or life gets too busy, don’t worry. Skipping a workout doesn’t wreck your progress unless skipping becomes more of a habit than working out. Developing any routine takes time. I struggle with daily prayer too, and that’s a good thing. It’s when we stop struggling that inertia takes hold. The practice of prayer is a lifelong habit, but it’s one that makes us more free as we become more disciplined. Interested in learning more about Orthodoxy? 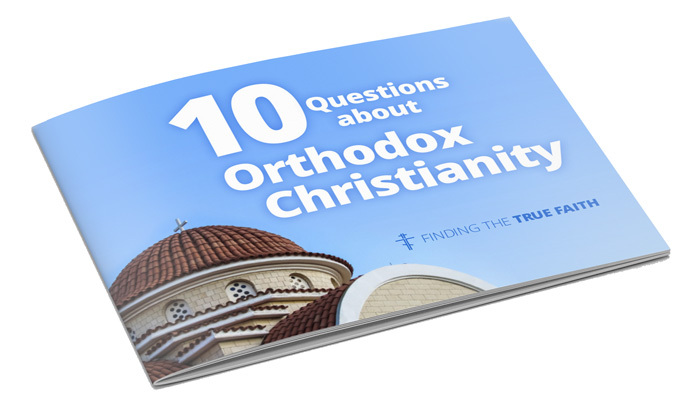 Subscribe to Finding the True Faith and download my FREE ebook, 10 Questions About Orthodox Christianity.